The blaeberry or Blaerdie (Vaccinium myrtillus) is a kin o buss that growes close tae the grund. It is a memmer o the genus Vaccinium. Thay are sib tae the North American blueberries an huckleberries. 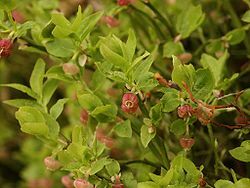 Wikimedia Commons haes media relatit tae Vaccinium myrtillus.